We love Valentines Day around our house, and the thing I love the most is making sure my kids feel loved. Sure this is something I try to do everyday, but on this day I want them to feel special. One of the things I like to do is to start out with a special breakfast. 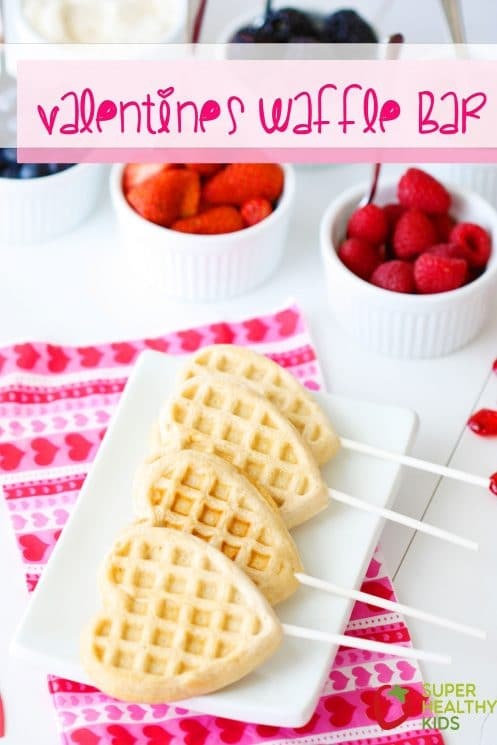 This Valentines Waffle Bar for kids is the perfect breakfast to help your kids feel like it is special. It is delicious, super easy, and the healthy toppings are endless! I bought this super cute heart waffle maker on Amazon for $30. I felt like it was worth it because I know I will not only use it every year for many years on Valentines, but I can also use it for birthdays or other special occasions. 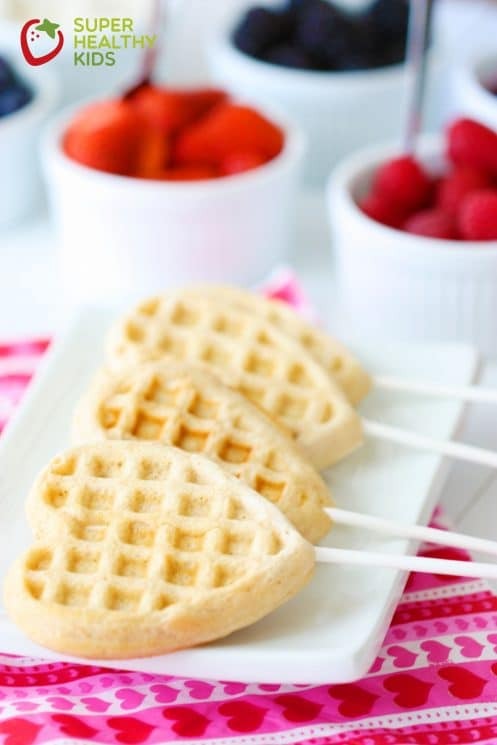 The best thing about this waffle maker is that it has a spot for a popsicle stick or a cake pop stick and so it turns your cute waffle into a waffle pop! My kids loved this so much and so did I! 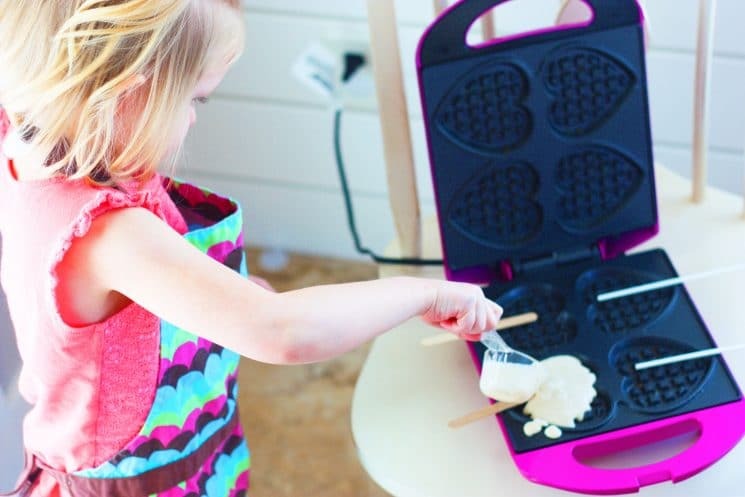 Waffles are a great recipe for your kids to learn some basic cooking skills. The batter is easy to mix up, and then they can practice pouring the batter onto the waffle iron. 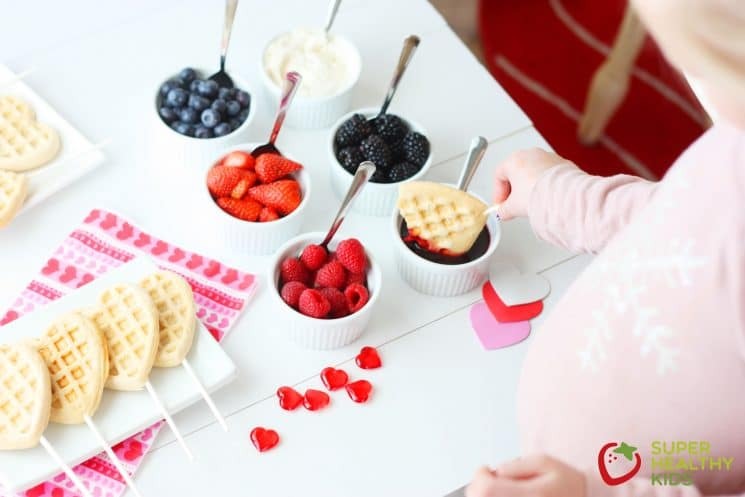 Even if they spill it doesn’t matter – you still get a great waffle! And if you don’t have a heart waffle maker, no worries! 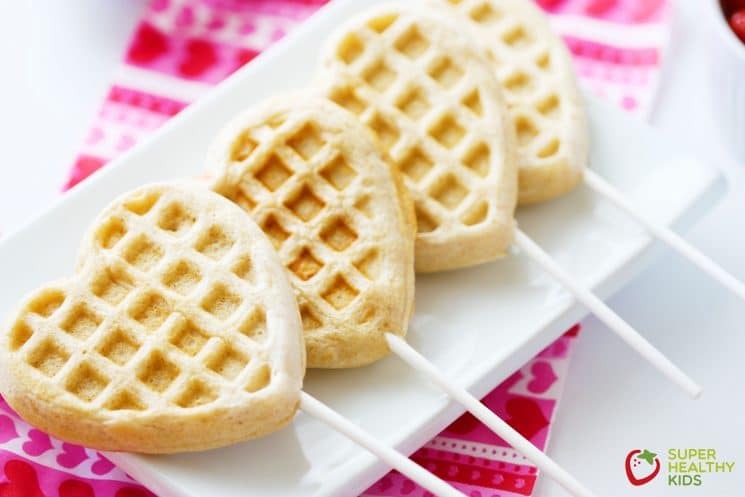 You can use a cookie cutter to cut out heart shapes of regular waffles. Of course our topping choices included lots of berries. If you can find fresh this time of year, you can definitely use frozen berries! They are still very nutritious and full of flavor. We like making our own berry syrup and use this recipe. You can use any type of berry for this – either fresh or frozen. To make our waffles, we love using our homemade pancake mix. You can mix up a big batch of it when you have a bit of time, and then just have it ready for a quick waffle or pancake breakfast. 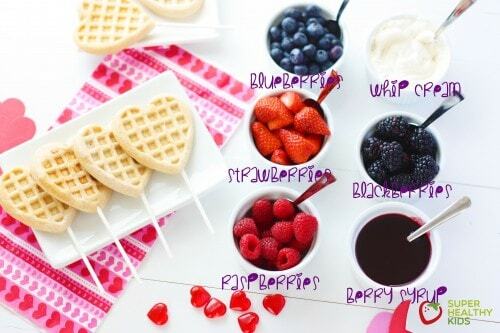 These waffles are so fun because you can dip them instead of pouring the syrup onto them. I feel like it made for an easier cleanup with my kids. Even my picky 6 year old couldn’t wait to try these – all of the toppings included! I am a big believer in trying the same foods with different cooking methods, presentation and textures. Who knows when they will decide they want to try something and like it! 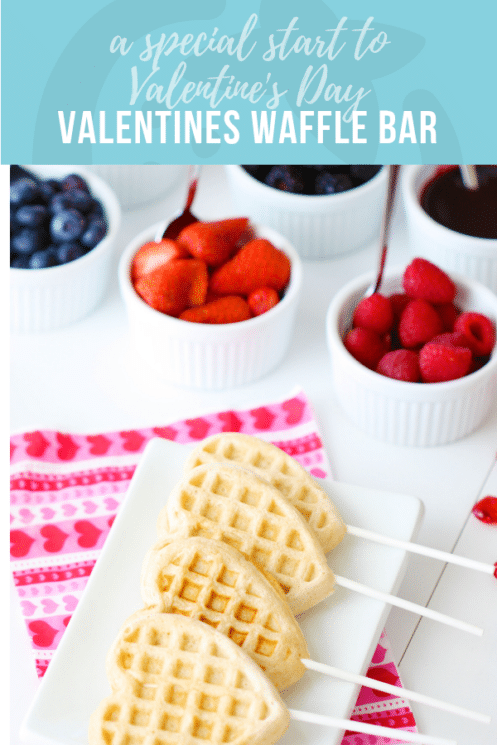 This Valentines Waffle Bar is definitely a winner with the kids! I just want to hang out in your kitchen! I love that Valentine’s Day falls on a weekend this year. Here’s to berry breakfasts galore! Beautiful pics, too!